The Idaho Coalition’s Power of Words poetry reading event was an inclusive environment for all of the Idaho middle school and high school students. Idaho youth challenged gender violence, inequity, and intersecting oppressions through poetry, the audience was impacted by diverse visual images, and Idaho Coalition staff showed up to create an inclusive, gender neutral restroom. During the set up, the venue staff expressed hesitancy about having a gender neutral bathroom, but our staff was able to explain our commitment to create inclusive spaces where everyone can feel valued regardless of their identity – gender, sexual orientation, race, ability, and more. At the end of event, a young girl approached a staff member and self-identified as a transgender girl. She shared that for the first time in Idaho, she felt welcomed, seen and safe. Why is this the Idaho Coalition’s work? Gender Violence occurs at such alarming rates because it is fueled and supported by multiple, intersecting systemic oppressions – sexism, homophobia, transphobia, racism, classism/poverty, able-ism, anti-immigrant or anti-refugee status. Systemic oppression describes the larger forces which dominate and harm certain groups of people. These forces go beyond individual behaviors of discrimination and mistreatment. Systemic oppressions, like transphobia, play out through institutions, power structures, cultural beliefs, and other systems – including public bathrooms. The Idaho Coalition chooses to stand with all groups who are harmed by these oppressions. It is also our work because individuals who experience multiple forms of oppression, such as LGBTQ+ individuals, experience significantly higher rates of gender violence. We have much work to do in Idaho. Sadly, this has never more clear than with the recent horrific homicide of Steven Nelson in Nampa, Idaho. While the four killers need to be accountable for this hate crime, our communities and our state are responsible for the culture and climate of homophobia and transphobia. Idaho continues to be a stronghold against civil and legal protections for people of all gender identities and sexual orientations. The Idaho State Legislature story is that only heterosexual people who identify with the gender they were assigned deserve our support and value. The Idaho Coalition rejects this narrative of Idaho, and instead chooses to create communities with equity and liberation, where everyone can thrive and reach their full potential. In honor of Mother’s Day, we spoke with Sarah O’Banion and her staff about serving families experiencing violence. Family Services Alliance was a pilot program with Resilient Families Idaho, an initiative of the Idaho Coalition to promote best practices for children exposed to violence and their non-abusing parents. How so? About 80% of our clients are part of families (parents or children). Ten years ago we had the same percentage, but our services were geared toward individuals. Now, we still meet the requests of survivors – sometimes she wants services only for her, sometimes only for her children. But in either of these situations, we also help bolster the connection between parents and children, and we’ve seen this approach make a big difference to families and even with our staff. Tell us more! We now have concurrent support groups. We used to provide simple childcare during women’s support groups. That was an important service. Now we staff the children’s groups with advocates and counselors that help children with safety, relationship and coping skills. We also run a teen support and empowerment group concurrently. So the whole family can come at once, and everyone has an enriched, supportive environment. Some people can see that their work with kids as separate, less important, or not their area of expertise. Yes. But our staff seems to understand that the team approach, with changing flexible roles, provides the most family centered supportive environment. All roles have equal importance! We enjoy Family Fun Nights too. It’s fun for us, and for the families. We invite our families to invite others that they think could benefit from our services. It’s a great way to foster family connections, and show people our place is a welcoming, supportive place to be. We do family yoga night with our trauma-sensitivity trained Yoga instructor. Other nights we paint pumpkins, decorate cookies, or do a movie. How do you find the money? We do it with very little money! We stand in front of the storage closet and think – what can we do with what we have? It’s gratifying to actually be able to come up with so many ideas. And we ask volunteers in the community for their time or materials. What else is important to share with partners across the state? Ongoing training for staff helps with buy-in to new practices and concepts. We’ve made our participation in community action teams more productive by offering training and recruiting volunteers. This has opened doors for us, and supports the community as well. With staff and partners, buy-in is a process. We try something, set the example, collaborate, and watch it grow. Separate responses to parents’ and children’s safety and well-being often place them at odds with one another. An integrated approach to working with the family as a whole results in better outcomes for children, their mothers, and the whole family. Building Promising Futures: Guidelines for Enhancing Response of Domestic Violence Programs to Children and Youth, by Eleanor Lyon, PhD, Julia Perilla, PhD, and Anne Menard for Futures Without Violence is a new resource for domestic violence programs, with guidelines to offer services for children exposed to domestic violence and how domestic violence programs can best respond simultaneously to the needs of children and their caregivers. Commitment to working with abused parents and their children/youth. Recognize that whether they plan to leave the relationship and/or remain in contact, abused parents are thinking about their children’s safety and well-being when they seek services. Advocates are prepared to talk with parents/caregivers about their children as part of their ongoing contact with them. Intake forms, assessments, and approaches reflect a strengths-based approach. Advocates explore the strengths and challenges facing each member of the family, including young children, as well as what would be helpful to them. Openness to each survivor’s perspective and respect for their decisions regarding the relationship, including decisions to stay in it or stay connected to their partner. Create rights and responsibilities (or shared agreements) rather than rules that are trauma informed, allow flexibility, and ease stress. Attend to staff/volunteer self-care and support through policies and practices that provide flexibility and understanding that this work can be traumatizing. Family-friendly, culturally relevant and inclusive environment reduces stress wherever possible for both parents and their children/youth. Explicit plan for how the program approaches children, including how and when they are included in conversations (especially conversations about violence), and the considerations that will guide decisions about inclusion, such as their developmental stage. 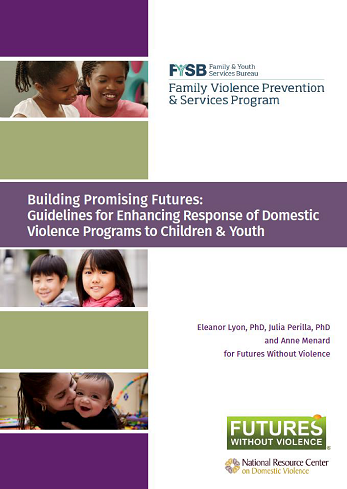 The Idaho Coalition was one of four state coalitions that informed the development of the recently released Building Promising Futures: Guidelines for Enhancing Response of Domestic Violence Programs to Children & Youth featured in this article! 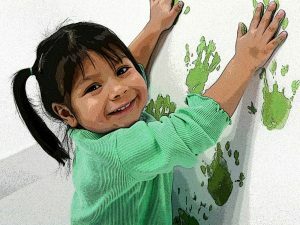 We want to thank the participating programs in Resilient Families Idaho – Family Services Alliance, Pocatello; Bingham Crisis Center, Blackfoot; and the Nampa Family Justice Center, Nampa – for their openness and willingness to explore trauma healing practices to promote whole resilient families. On our first [prompt], we introduced spaciousness as a breath, an interval, or a brief pause from our daily work. Can you remember why spaciousness is essential for self-care? If you answered something like: “because it allows you to think creatively to imagine new possibilities for greater impact and to be sustainable in the long haul?” You got that right! Poetry is an amazing tool for helping to cultivate spaciousness and unlock our creative side. 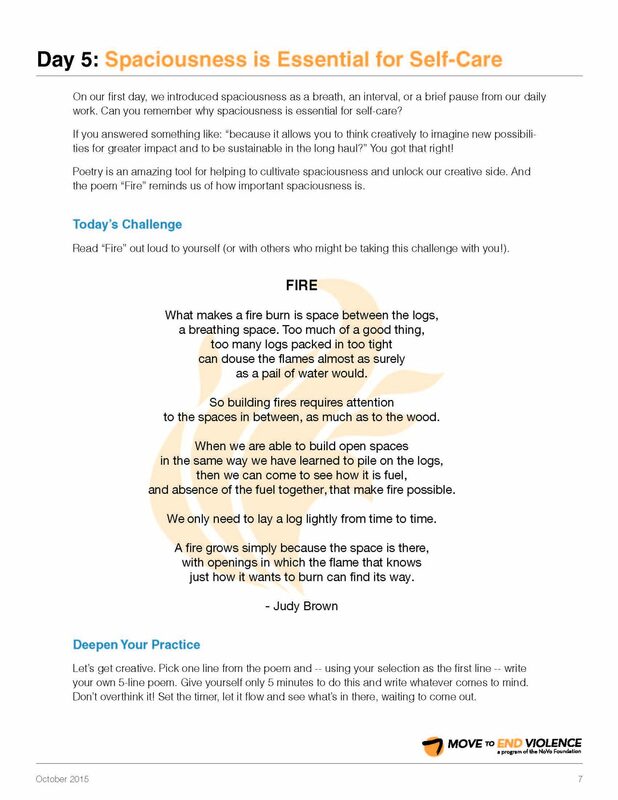 And the poem “Fire” reminds us of how important spaciousness is. 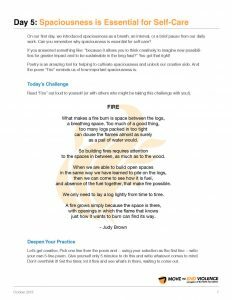 Read “Fire” out loud to yourself (or with others who might be taking this challenge with you!). The National Institute of Justice released a new report on American Indians and Alaska Natives Experiences with Violence and Victimization. 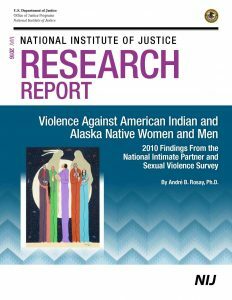 This report examines the prevalence of violence against American Indian and Alaska Native women and men, using a large nationally representative sample from the National Intimate Partner and Sexual Violence Survey (NISVS). More specifically, it provides estimates of sexual violence, physical violence by intimate partners, stalking, and psychological aggression by intimate partners. It also provides estimates of interracial and intraracial victimizations and briefly examines the impact of violence. Results should be used to raise awareness and understanding about violence against American Indian and Alaska Native women and men. Survivors of abuse in later life can benefit significantly from services provided by domestic and sexual abuse victim service providers. This webinar will explore how the experience of older survivors may differ from younger survivors seeking help. Explore collaboration and how it might be different when working with older survivors.